*Note: These fans are variable speed (infinite range) and made to work with a solid state rheostat speed controller which is sold separately. The speed controls shown on this page are not designed for wet locations. They must either be mounted in a dry location or under a weatherproof box. 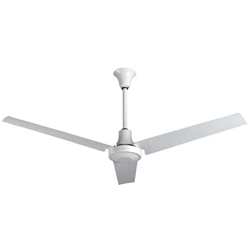 The Model #INDB60MR4L ceiling fan is reversible. The model ICFCFR5 variable speed control with reversing switch must be used (Sold Separately) in order to reverse rotation of ceiling fan.